Right or wrong are not relative terms. There are fundamental truths to establish these two stipulations. 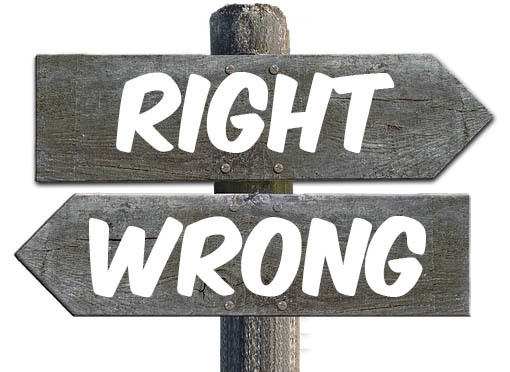 You are right or you are wrong are the two sentences commonly uttered when you commit something right or right in your life. While ‘Right’ or ‘Wrong’ is one of the greatest opportunities you will ever be given to affect change, impact your own life and completely shift gears, but it definitely depends upon the one’s personal concept. Everyone could be right in his own way but everyone could also be wrong in others way. Being wrong means, you have the opportunity to try again to reach your next level. The common problem is when that opportunity comes along, we rarely take it. Instead, we try to find a way to weasel out of it or achieve something by use of cunning or deceit and somehow be right. Being right in life in the eyes of others is the only important thing as it matters more than anything else. I have seen nobody wants to get it wrong and don’t want to look like a fool. It’s a human reaction as nobody wants to give the impression of being branded as wrong factor person. A long back, when I had gone to meet RM - Regional Manager – a versatile personality - the first thing I noticed on entering his chamber was a big board hanging on his back with a quote – There are two rules. Rule Number One -Boss is always right. Rule Number Two – If the boss is wrong, see Rule Number One. Really, I had to believe him what he said and I also experienced that he was a man of principles that is why; he dared to dangle a big board of his authority behind his seat. Our world is at the crossroads but has a number of choices between right and wrong. The pendulum of the mind alternates between sense and nonsense, not between right and wrong. Right is right and wrong is wrong and when peopling start getting it confused, that means they need to sit down with some real people. Joe Wurzelbacher has rightly observed that I don’t believe there are two sides to every story. It’s black or white and there is a right or wrong. Frankly speaking, when the things don’t work to your satisfaction, one would generally feel resentful, unappreciated and misunderstood. You are at the crossroads that might have been provided by the circumstances around you or provoked by nears or dears even with simple words. One thing is certain that between right or wrong, ‘or’ is more important. You can have the choice between one and the other, as you just cannot have both. Right is right even if no one is doing it, wrong is wrong even if everyone is doing it. So sometimes being wrong is a lot better or valuable than being right because the tragedy for everyone is not the conflict between right and wrong but between two different kinds of right. It is because of the fact that right or wrong becomes more difficult for each of us as we grow older. The older we get, the more we know personally about our own human frailties. It’s an art learned by experience. Take care to choose between right or wrong.